“Hey, how many bags of milk do we have left?” is a question you commonly hear in our apartment. Milk in Buenos Aires comes in two types of containers: milk in a box, or milk in a bag. Tom and I used to buy the milk in a box. It is pasteurized regularly and tastes fine. 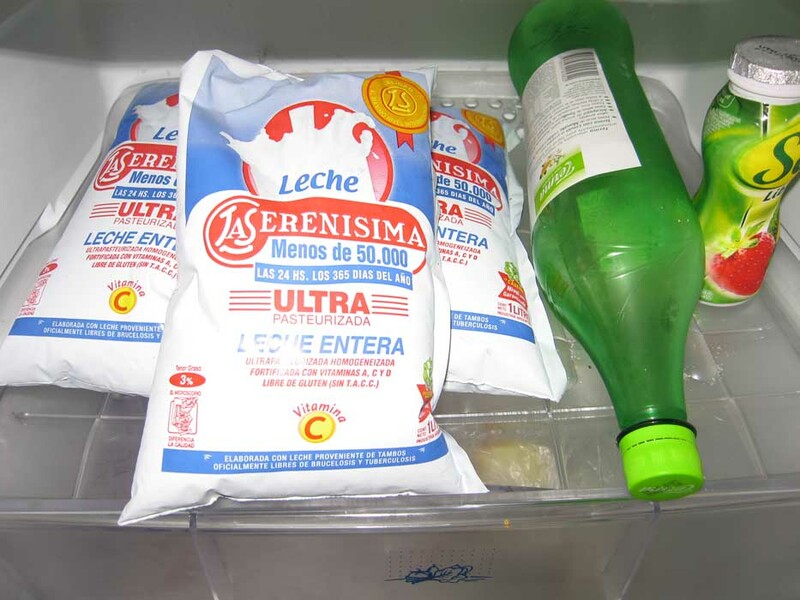 One day, Ian did the shopping, and bought the milk in a bag because it’s a peso cheaper. The milk in a bag is ultra pasteurized, which leaves any dairy product with a slightly off taste. (Do a side-by-side taste test at home if you don’t believe me.) 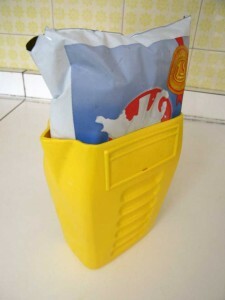 Ian also bought the yellow plastic milk-in-a-bag holder/pourer that you need in order to successfully wield the bagged milk. Now, for some reason, we keep buying the milk in a bag even though we prefer the taste of the milk in a box. To make our continued patronage even more confusing, I am very challenged by the milk in a bag. I often forget to put it in the plastic container before cutting the corner of the bag, which then makes it a challenge to stuff the bag in the container without spilling. I also am known for accidentally cutting the pouring spout hole in the bag too large, which creates a sort of milk fire-hose effect when you try to pour! Everyone lives in fear of me changing out the bag of milk — hee hee. This entry was posted on Saturday, November 29th, 2008 at 3:46 pm. You can follow any responses to this entry through the RSS 2.0 feed. You can leave a response, or trackback from your own site. But is Sacs O’Milk funnier than Bags O’Milk? That’s the real question!